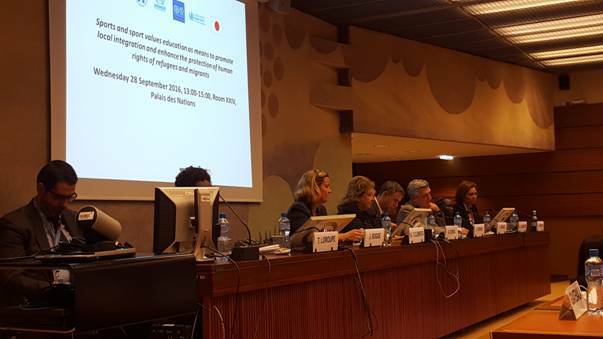 On 28 September 2016, Greece’s Permanent Mission to the United Nations in Geneva (UNOG) organized a high-level side event on the topic: Sports and sport values education as means to promote local integration and enhance the protection of human rights of refugees and migrants. The central theme of the panel was how sports can be an entry point for refugee and migrant children to integrate into their host communities. For these children and young people, sports can play a healing role that can bring a sense of normalcy to their uncertain lives and reduce the sense of marginalization. International organizations like the IOC, IOM, and HCR have used sports to help refugee and migrant youth through: integration into host communities; fostering trust between cross-border communities; youth rehabilitation; building “safe places” for sports in areas with a high refugee population. The goal of these programs is to develop youth in a positive manner and to provide skills and hope where the absence thereof could lead children to resort to violent extremism or other adverse consequences. IOC President Thomas Bach, and other panel speakers, lauded the impact that the ROT made at this year’s Summer Olympics in Brazil. The ROT exposure at such a high profile event presented a different face to the word “refugee”. Tegla Laroupe, former Olympic marathon runner and refugee, shared her story about running 10 kilometers to school when she was a child. At the time she did not know she was doing sport; all she wanted was to run for her right to an education. Rose Lokonyen shared her story of fleeing the Sudan as a young child. She faced similar problems as Laroupe, in that girls were not allowed to play sports. However, both athletes reiterated their desire to fight for other women and refugees in Africa to have this right. Deputy High Commissioner for Human Rights Kate Gilmore spoke of how sports are a unique asset in fostering belonging, shared interests and passions among youth, and confirm a common human purpose. She recognized how difficult it can be for States to implement the “hardware” processes of receiving, integrating and hosting migrants and refugees, but also spoke of the “software” challenges of embracing these vulnerable people. Gilmore linked the rules of sports and their universal values with that of human rights law and values. In the sports field, everyone competes with the same rules and participates based on merit and talent; anything beyond the rules is considered out-of-bounds. The same should be considered in the field of human rights. The panel of distinguished speakers included: Thomas Bach, President of the International Olympic Committee (IOC), Dr. Jacques Rogge, former IOC President and current UN Special Envoy for Youth Refugees and Sport, UN High Commissioner for Refugees (HCR) Filippo Grandi as well as Kate Gilmore, Deputy High Commissioner for Human Rights (HCHR) and Ambassador Laura Thompson, Deputy Director General of the International Organization of Migration (IOM). In addition, two Olympic athletes, Rose Lokonyen of South Sudan and Tegla Loroupe of Kenya, representatives of the first ever Refuge Olympic Team (ROT), spoke at the panel, which was moderated by H.E. Ambassador Anna Korka, Permanent Representative of Greece to UNOG.